Here's a look at the federal government's response since Hurricane Maria. The Trump administration is pushing back against criticism that the U.S. government has been slow to respond to hurricane-battered Puerto Rico. “I understand the [media] coverage in some cases is giving the appearance we are not moving fast enough,” President Donald Trump's homeland security adviser, Tom Bossert, told reporters outside the West Wing of the White House today. "What I will tell you is we are mobilizing and marshaling the resources of the United States of America in a way that is absolutely professional and fast and adequate to meet the needs," Bossert added. Hurricane Maria roared ashore in Puerto Rico last week, killing at least 16 people and knocking out power there. Trump announced Tuesday he will make his first visit to the island next week to survey the damage after critics -- both Democrats and Republicans -- accused his response to the devastation there of being lackluster. In defending the federal response, administration officials told reporters today that food, water and other necessary supplies have already been delivered to the island. "We are working on bringing additional for replenishment," said Elaine Duke, acting secretary of the U.S. Department of Homeland Secretary. "We are using air support when we can't get through. We are cleaning the roads regularly, we have expanded greatly, probably 90 percent of the island is accessible now -- limited." 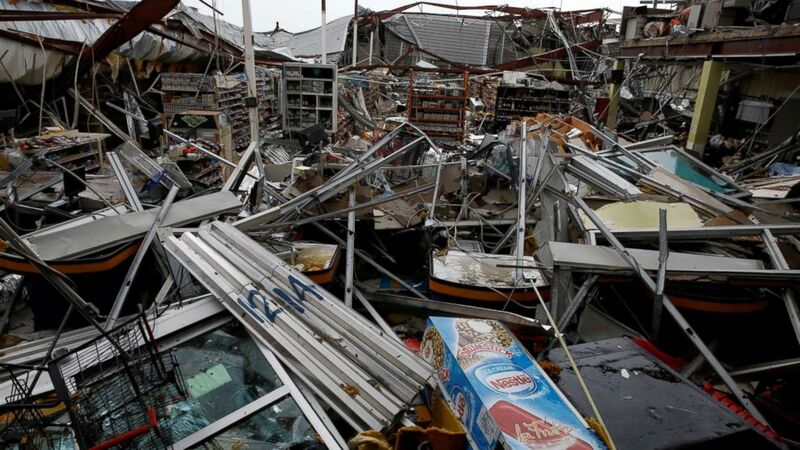 (Carlos Garcia Rawlins/Reuters) Damages are seen in a supermarket after the area was hit by Hurricane Maria in Guayama, Puerto Rico, Sept. 20, 2017. Maria made landfall near Yabucoa, Puerto Rico, as a major Category 4 hurricane around 6:15 a.m. ET with 155 mph winds, according to the National Hurricane Center. It was the first Category 4 storm to hit the island since 1932. Maria dumped 20 to 30 inches of rain on Puerto Rico in 24 hours. Puerto Rico's office of emergency management later confirmed that 100 percent of the U.S. territory had lost power, noting that anyone with electricity was using a generator. An official with the U.S. Department of State told ABC News at the time that a hurricane task force is monitoring Maria's path in the Caribbean and will coordinate evacuations for American citizens and provide aid on the ground. That night, Trump tweeted a message of support for Puerto Rico, which was reciprocated by the island's governor, Ricardo Rosello. Rossello spoke to Vice President Mike Pence by phone earlier. Rossello imposed a curfew on the island that night from 6 p.m. to 6 a.m., which has been extended indefinitely and the hours changed to 7 p.m. to 5 a.m. Speaking at the United Nations General Assembly in New York City, Trump said Hurricane Maria "absolutely obliterated" Puerto Rico and "totally destroyed" the island's power grid, but that the recovery process will begin soon with "great gusto." The island “got hit with winds, they say they’ve never seen winds like this anywhere," Trump added. New York Gov. Andrew Cuomo departed for Puerto Rico to bring donated supplies to the island and assess the need after Puerto Rico's governor made a request for aid. Cuomo traveled with members of the National Guard as well as New York congresswoman and Puerto Rico native Nydia Velázquez. At a press conference that afternoon, Puerto Rico's governor said water supplies on the island are lacking because of the lack of power. In addition, the water agency suffered "severe damage," Rossello said. To date, FEMA and its federal partners had provided more than 4 million meals, 6 million liters of water, 70,000 tarps and 15,000 rolls of roof sheeting to both Puerto Rico and the U.S. Virgin Islands since Maria made landfall. An additional 7 million meals and 4 million liters of water were being transported to the islands by barge. Ten FEMA urban search and rescue task forces were conducting operations in Puerto Rico. The teams so far had rescued 557 people and five pets after combing through more than 2,600 structures. Meanwhile, the American Red Cross had mobilized 9,000 comfort kits as well as several thousand tarps, flashlights, batteries, blankets and hand sanitizer to Puerto Rico. The energy department was also working to facilitate fuel deliveries across Puerto Rico for generators at these critical facilities and response efforts. To date, more than 4.6 million barrels of oil from the Strategic Petroleum Reserve had been delivered to areas, including Puerto Rico, impacted by hurricanes Maria, Irma and Harvey, according to FEMA. 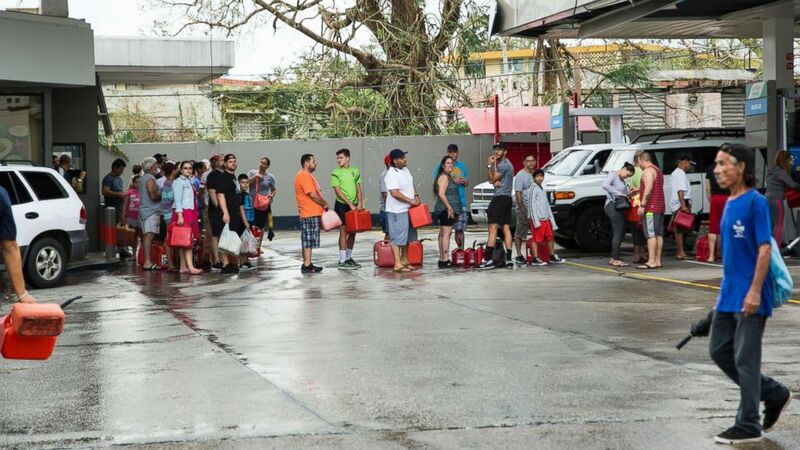 (Erika P. Rodriguez/The New York Times via Redux) People line up to fill gas cans after Hurricane Maria in San Juan, Puerto Rico, Sept. 21, 2017. With at least 5,600 personnel deployed to Puerto Rico and the Virgin Islands, the U.S. Department of Defense announced it had conducted at least eight medical evacuations at the time. The U.S. Department of Health and Human Services said it had deployed 300 people to Puerto Rico and the Virgin Islands, and "additional medical professionals" were "available as needed." Moreover, assessments conducted by the U.S. Army Corps of Engineers showed an estimated 30,000 roofs are damaged in Puerto Rico. Power assessments remained underway at critical facilities while surveys across the island are determining the state of routes for debris removal, according to FEMA. But many residents told The Associated Press they were still waiting for help from anyone from the federal or Puerto Rican government. "People say FEMA is going to help us," Maribel Valentin Espino said as she showed reporters around the sopping wet wreckage of her home in northern Puerto Rico. "We're waiting," she said. Following a request from the governor of Puerto Rico, Trump said his administration was "thinking about" waiving the Jones Act, a century-old law that requires all goods shipped between U.S. ports be carried on U.S. owned-and-operated vessels. Meanwhile, Rossello continued his calls for action from Congress in the wake of the hurricane while speaking from Camp Santiago on the Puerto Rico National Guard base in the hard-hit town of Salinas. Federal and local officials will have reached all towns in Puerto Rico by the end of the day or next. Still, funds from the Puerto Rican government are running low, he said. Just 4 percent of Puerto Rico had electricity at that time, most of which is concentrated around hospitals, and 80 percent of telecommunications were still down, while only 52 percent of the island had safe drinking water, according to Rossello. 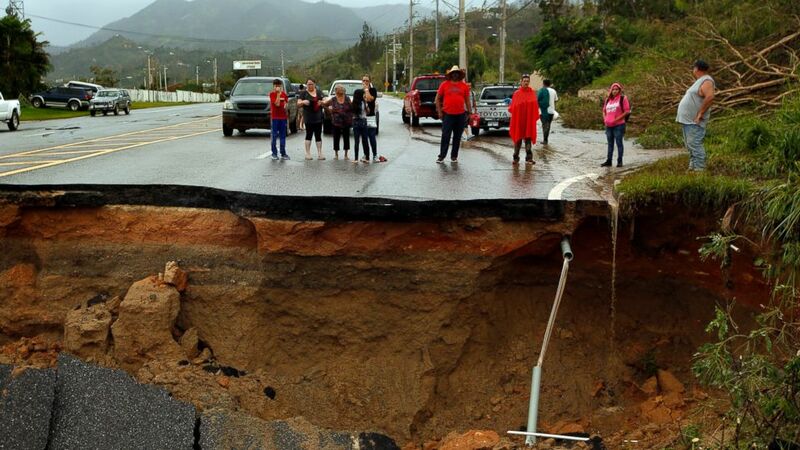 (Carolyn Cole/Los Angeles Times/Polaris) Highway 10, a major north-south connection through Puerto Rico is completely washed out, leaving people cut off, Sept. 23, 2017. In the mountain town of Utuado, Puerto Rico, residents are struggling to recover after hurricane Maria. The main north-south road has completely washed out in one section, leaving people on the on the south side cut off. Amid pleas for more help on the ground, U.S. Army Brig. Gen. Richard C. Kim arrived in Puerto Rico to take charge of the humanitarian assistance mission there and to coordinate recovery efforts with authorities. The American Maritime Partnership, the voice of the U.S. domestic maritime industry, issued a statement saying it was "actively working" with the federal government and relief organizations "to deploy quickly and deliver essential goods like food, fuel, first aid supplies and building materials." Domestic maritime companies had already moved approximately 9,500 containers of goods in Puerto Rico. "A steady stream of additional supplies keeps arriving in Puerto Rico on American vessels and on international ships from around the world. The problem now is distributing supplies from Puerto Rico’s ports inland by surface transportation,” said Thomas Allegretti, chairman of the American Maritime Partnership, said in a statement. White House press secretary Sarah Sanders announced the president has authorized that shipping restrictions, via the Jones Act, be waived immediately for the island. The move is intended to expedite the delivery of needed relief supplies there. Once it's signed, the waiver will be in effect for 10 days and covers all products being shipped to Puerto Rico, according to the U.S. Department of Homeland Security. “This waiver will ensure that over the next 10 days, all options are available to move and distribute goods to the people of Puerto Rico," acting Secretary Duke said in a statement. "It is intended to ensure we have enough fuel and commodities to support lifesaving efforts, respond to the storm, and restore critical services and critical infrastructure operations in the wake of these devastating storms." Jones Act vessels can carry more than 4,000 containers of goods to Puerto Rico per week, according to the American Maritime Partnership. 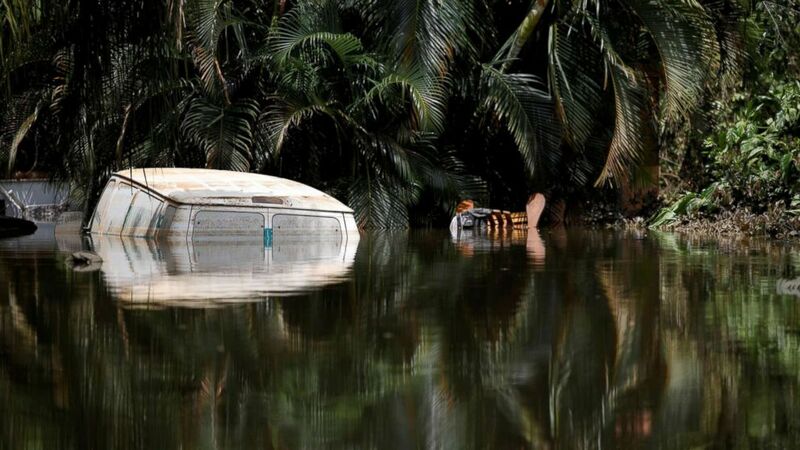 (Carlos Garcia Rawlins/Reuters) A car submerged in flood waters is seen close to the dam of the Guajataca lake after the area was hit by Hurricane Maria in Guajataca, Puerto Rico, Sept. 23, 2017. As of 8 a.m., the U.S. Department of Defense said its teams had completed 47 of 69 of hospital assessments, delivered fuel to nine hospitals and provided 900 super sandbags to shore up a damaged dam in Puerto Rico. That afternoon, the defense department said it has four scheduled flights to deliver power generation capabilities, medical supplies, contingency response units, communications support, as well as assisting with commodity distribution in Puerto Rico. ABC News' Erin Dooley, Joshua Hoyos, Alexander Mallin, Elizabeth McLaughlin and Eva Pilgrim contributed to this report.